With this intensely icy weather our country is experiencing at present, the only food that should be served are the ones that warm your tummy, soul and heart. And of course, yet again, soup has come to the rescue. As I’m typing this, my fingers are blue, but this soup recipe is one that you HAVE to have in your arsenal so I shall continue! I actually can’t believe I’ve gone all winter without making this soup. 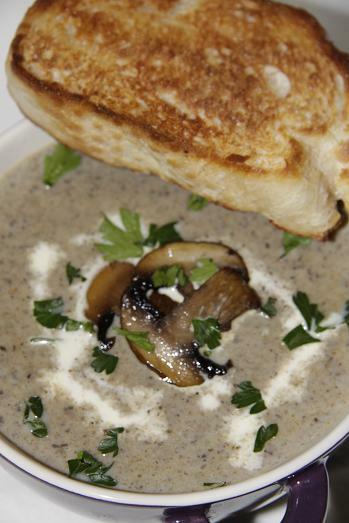 I’m not really crazy about mushrooms, especially not on pizza or in quiche, but there’s something about a bowl of creamy mushroom soup paired with a big chunk of crispy bread that just says “Comfort”! And it helps that it’s so darn easy to make. To thicken this soup, you can either use a few cooked potatoes and just whizz it with the mushrooms, or you can mix 1tsbp cornflour in with the cream and allow it to bubble until the ‘flour-iness’ has cooked off. I do it this way as I don’t like the extra effort the potatoes add. In a large pot, melt the butter and sautè the leeks and garlic until soft and slightly golden. Add the mushrooms and allow to sautè until liquid is released from the mushrooms. You’ll notice that it’s quite a lot of liquid but don’t get worried, that’s all flavour so you want that to happen. Add enough stock to just cover the mushrooms and allow to simmer for 7-10 minutes. Return to the heat and add the cream (mixed with cornflour if you prefer). Allow to simmer gently for 5 minutes and add the lemon juice and seasoning. Serve hot with a swirl of cream and buttery toast. What an amazing soup, I just LOVE mushrooms and I love soup, can’t believe I’ve never made this before! 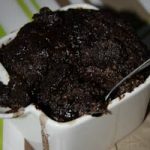 Incredible, simple and delicious! Thanks! Absolutely my pleasure! 🙂 Let me know how it turns out! we have this every time we go to rugby!